MEMA NorCal attendees awaiting their turn on the NASCAR course. Photo courtesy of David Worthington. The newly created Northern California Chapter of the Municipal Equipment Maintenance Association (MEMA NorCal) held its first event at Sonoma Raceway on May 19. More than 120 fleet professionals and industry vendor partners attended, and it had been sold out nearly a month in advance. Paul Jontig and Bruce Derby from Toyota made a presentation on the soon-to-be-released hydrogen fuel cell vehicle, the Toyota Mirai, and the company’s commitment to fuel cell technology for the future. 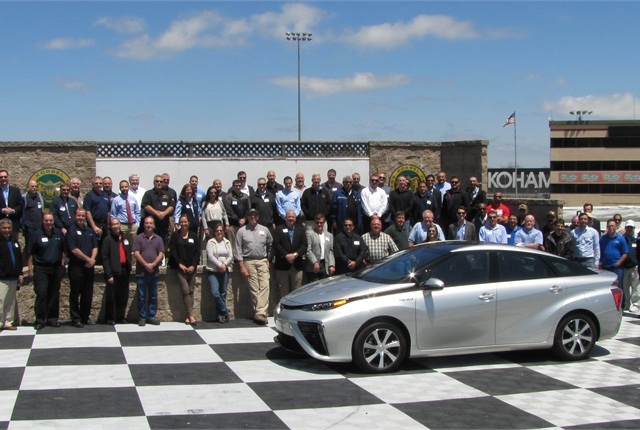 Attendees were also able to test drive the zero-emission Mirai. Other presenters included: Dawn Saunders from Verizon, who spoke about the benefts of telematics in public fleets; Joe Keefe from AssetWorks, who spoke about the company's suite of software and hardware solutions for municipal fleets; Jon Littler from GovDeals.com about the benefits and ease of use of online auction services. Additionally, Lisa Chiladakis from the California Air Resources Board and the Plug-in Electric Vehicle Collaborative gave a presentation on all-electric and plug-in electric hybrids and grant funding; Randy Wilde, from the Center for Sustainable Energy, gave a presentation on what incentives are available and how simple the process is to apply for funding; and Craig Weaver, a California Highway Patrol Motor Carrier specialist, spoke about the upcoming changes to the California Basic Inspection of Terminals (BIT) Program beginning in January 2016. Professional motorsports drivers took attendees for a ride in stock Toyota Camry models around the same road course layout that NASCAR will compete on during the Toyota/Save Mart 350 race weekend.